I’m finally getting around to processing the several hundreds of images from my trip to San Francisco back in early June. During that business trip, a couple of friends and I took a day trip away from work and the City, venturing out onto Point Reyes and Tomalas Bay. An old Navy "taxi" we were told about. While we were shooting this old boat, we saw an old sea dog walking around with another person. We overheard bits of what he was talking about, and soon started asking questions. We learned that this boat was an old Navy “taxi” for taking sailors from the big Navy ships in to harbor for onshore adventures. The second tidbit was that after it was retired and the boat became somewhat a fishing boat, the entire second “level” was added to gain height needed for spotting fish. Pretty cool little boat with a storied past! 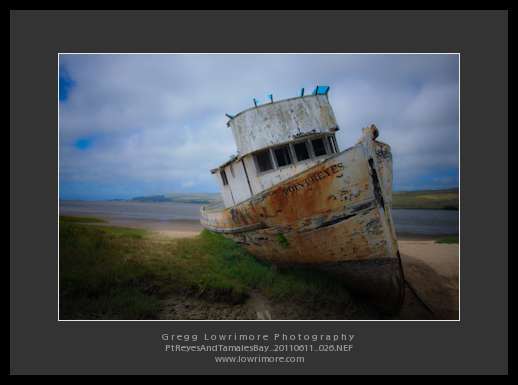 Posted in Landscapes and tagged boats, lighthouse, Pacific Ocean, Point Reyes, San Francisco, Tomales Bay by greggl with 1 comment.